Vintage Gardenia was released last year to celebrate the Jo Malone brand's 10th anniversary. The fragrance notes include gardenia, tuberose, cardamom, incense, myrrh, and sandalwood. Vintage Gardenia starts with, obviously, gardenia, but just as Chanel Gardenia starts true to its name and ends up mostly jasmine, so the Jo Malone version goes, but in this case tuberose is the main floral note. It is a big, lush, tuberose only for a very short time, after that, it is very restrained. Once it calms, the sandalwood and myrrh are as prominent as the tuberose, and there is a subdued, slightly dusty hint of spice. I can't really smell the cardamom in particular, just something spicy, and I can't make out the incense either. Do not be scared off by the "vintage" in the title, this does not smell in the least old fashioned, and while it is very feminine, it does not scream white floral. Nor is it an oriental, as you might assume from the notes. It is a very soft and smooth fragrance, just lightly sweet, and it stays close to the skin. I have to admit that many of the Jo Malones do not work for me, although I do like Black Vetyver Cafe and French Lime Blossom. The Vintage Gardenia is by far my favorite of the line so far. The lasting power is reasonable given the cologne concentration. There is a 30 ml bottle available for $48, and a 100 ml bottle for $80. 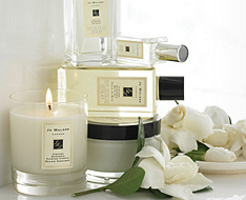 Jo Malone encourages fragrance layering, and you can find a number of suggested combinations on her website. For Vintage Gardenia, she recommends Black Vetyver Cafe, Wild Fig & Cassis, and Grapefruit. I'll be interested in sniffing this! Maybe it will be at NM when I get there next Saturday. I admit, at first, I was kind of disappointed, like, ANOTHER gardenia? LOL But, looking at those wonderful base notes in there and being a Spice Girl, I am gonna be all over this! Hope it smells as good as it sounds…we all know that sometimes that is NOT the case! P, I will be curious to hear what you think if you try it. It might not be spicy enough for a spice girl! It has been out since last fall, but I have no idea how long it has been in the US or if all the NM have it yet. It is on their website. I love french lime blossom and lime/basil/mandarine. But need to try nutmeg/ginger and, now, the vintage gardenia. I have deep cynicism whenever I read the words “acquired by Estee Lauder” — wish we knew whether her formulations changed at that point. Although we're still enjoying them, thankfully. and thanks again for great information, R.
M, I tried the Nutmeg & Ginger on a card, but I really need to spray on skin to have an opinion. EL owns EVERYBODY, so there is no point in my complaining! The least they could do though is have JM in the outlet shops, LOL! I've never tried this. I thought I'd like the Nutmeg and Ginger a lot more than I did. I'm a total Spice Girl as well and it didn't do anything for me – perhaps another test is in order! I only tried the N & G on a card, and I had the same reaction — where is the spice? But I am so often deceived by cards, so I really need to put it on skin to be sure. BVC and VG both for Xmas from hubby (from my list, of course). He actually used BVC once and it smelled great on him. I find it lasts well. Hubby loves when I wear VG and I get comments on this one from other men. Little more feminine than I usually wear, but great with a girly look! New layering: Vintage Gardinia with Suzanne Lang's Red Ginger – lovely combo; softens the sweetness of gardenia and pulls up the spiciness of red ginger. I bought the Vintage Gardenia, and promptly returned it. It is somehow initially heady and intoxicating, but awfully sweet. Too sweet for the likes of me. And yes, it is difficult to layer in the celebrated J.M. layering tradition! It is a strident scent, difficult to mix harmoniously with others. I have been reading your blog for the first time, but voraciously. Great blog: Thank you! I have heard you say a couple times you feel stuck with products you regret having bought on a whim (like this one). I would suggest buying J.M. products (or really anything) from your local Nordstrom if you have one. I live in Seattle, Nordstrom’s hometown, and what I love about buying fragrance there is that you can definitely absolutely no problem return things there simply because you stop liking them. I have literally gone back the Jo Malone counter and been like, I thought I liked this perfume, but it’s starting to annoy me, and they are just like, bummer, let’s refund you. Great place. Thanks again for your nose’s great research! From another fragrance-obsessor. Cheers.